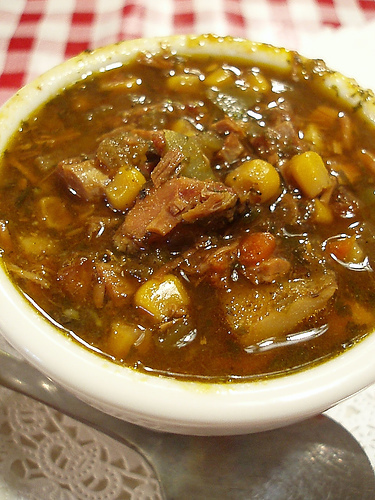 I first made this stew on Derby Day, in honour of the Kentucky Derby and its traditions. A word to the wise: don’t be sipping too many Mint Juleps while you’re cooking or you could be in big trouble 🙂 The best way to make burgoo is slowly – they say to dedicate 6 hours of preparation time, and making it the day before is best. The traditional recipe called for whatever meat might be available, which seemed to include roadkill (squirrels, oppossums?!) I like this version with domestic meat. It still follows the rule that more than 1 meat is included, and also the rule that you can stand a spoon it it. I did not, however, follow the rule that says it should be cooked outside over an open fire. Thanks to the Kentucky Bourbon Cookbook for this delicious recipe. It does make enough to feed an army but I wanted to reproduce it in its entirety. Feel free to freeze some or share with friends (or reduce it if you must). 1. Put the pork, veal, beef, lamb, and chicken into a large pot. Add the water and bring it to a boil slowly. Simmer until meat is tender enough to fall off the bones, about 4—6 hours. 2. Lift the meat out of the stock. Cool the meat, remove it from the bones, and chop it. Return the chopped meat to the stock. 3. Pare the potatoes and onions and dice them. Add them, plus the carrots, green peppers, cabbage, tomato puree, corn, red pepper, okra, parsley, lima beans, celery, and bourbon, to the meat and stock. Allow the stew to simmer until very thick about 6 hours. 4. (Happy Gourmand addendum) Serve to all your friends, with cornbread if at all possible. 4. Season to taste with the salt, pepper, Tabasco, steak sauce, and Worcestershire sauce.